From 1957 comes an overlooked musical from Rogers and Hart, based on a John O’Hara book. Pal Joey has top-drawer firepower with Kim Novak, Rita Hayworth, and Frank Sinatra. Set in San Francisco with much location shooting, you will have a sense of what it was like in the Red Light district. Not a year later, Hitchcock would bring Kim Novak back to the setting for Vertigo. Sinatra is in typecast form as the brash lounge singer who foists himself on whoever is handy. He downplayed what he didn’t like and made the character a version of himself. His dream is to have his own nightclub where he can sing and star. In the meantime, his two-bit hoodlum act wears thin on almost everyone, but he is a ladies’ man, as they used to say. Sinatra could not have two better, bigger co-stars. Sinatra even gave Hayworth top billing as the “older woman.” Mae West was originally considered for the role with Billy Wilder directing. Rita Hayworth is on the cusp of middle-age and seems to be playing her patented Gilda a dozen years later. She is now a rich widow with a tainted show busy past. When Sinatra forces her to perform at a charity auction, she seems about ready to sing “Put the Blame on Mame,” and actually does a satiric number in which she strips off her gloves (both of them, this time). Sinatra woos her for the start-up money for his lounge on Nob Hill—and voluptuous Kim Novak rises from the chorus to a featured singer and dancer. Sinatra even re-did the final fantasy dance scene with all three stars, which is sad because Rita Hayworth was a real dancer. The film shines, despite changes orchestrated by producer Harry Cohn and Sinatra. It’s still classic crooner Sinatra. For the uninitiated landlubber, it’s a yacht. When you own a boat that is over 55 feet in length with a couple of masts, you probably have enough money to hire Billy Budd to do your foretopping, if you like that sort of thing. 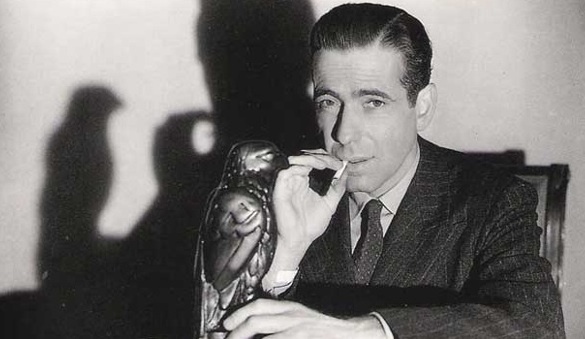 Humphrey Bogart spent his hard earned money from films like The Maltese Falcon to buy his yacht, which he kept until his death in 1957. He and Lauren Bacall spent many weekends away from the Hollywood set on their schooner. It fell into disrepair in recent years, but is now over at a boatyard in Little Rhodie being restored to its former glory at the Portsmouth port. Bogart called his little ship “Santana,” and seemed to find it “the stuff dreams are made of” far more than that disgusting black bird that Sydney Greenstreet (ergo, The Fat Man) chased all over San Francisco. Now dubbed “Bogie’s Boat,” the little clipper may yet race at Newport with a new life and new owners. Of course, our favorite story about Bogart’s boat had to do with his great film The Caine Mutiny. If you don’t recall, you deserve to give yourself a treat and see Humphrey Bogart at his most enthralling. In that film he played the notorious Captain Queeg, a World War II captain with mental problems (like so many in literature). Herman Wouk’s character was brought to life in ways no one could have predicted by Bogie. Queeg was more than a little strange. He used to roll ball bearings between his fingers when stress got to him. When he went on the witness stand after his crew declared him a nutcase and took the ship, he broke out those little ball bearings to prove the case. After the movie was a big hit, Bogart was furious because his old friend Frank Sinatra played a prank of major proportions. He loaded up the ship with silver ball bearings that rolled all over the place with the tide. No word has emerged yet if the ghost of Bogie and the ghost of Sinatra will be shipping out on the restored yacht. The Patriots have to beat two teams to proceed to the Super Bowl. Those teams are ostensibly the Colts with Luck and the Broncos with Manning. After that comes the deluge known as the Seahawks—unless Lady Luck proves to be a faithless hussy. There could be a match with the Chargers and Danny Woodhead in Bill Belichick’s future, but that’s a long-shot, though preferable for many who believe in the Easy Button. In any respect the ghosts of Wes Welker and Danny Woodhead may live to haunt the Patriots who let both men take another path to the Super Bowl. The Colts have just signed Deion Branch for one game. His job is similar to that of Edward Snowden. He is to spill his guts on all the security measures Bill Belichick has up his slippery sleeve. Branch will make a hefty salary for providing information that causes people to be assassinated in John Le Carre novels. 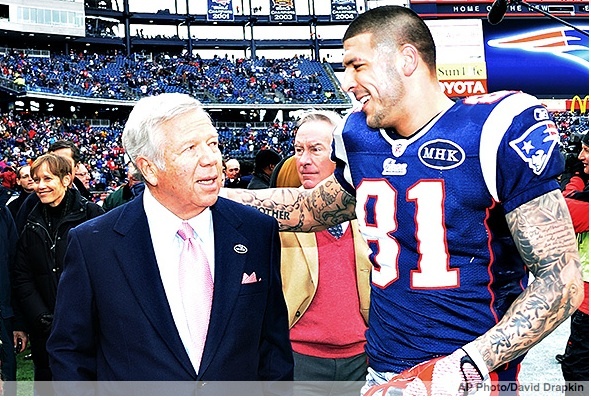 He may be bitter at the Patriots who let him go after he supported murderer Aaron Hernandez in the media. With another Patriot going down with injury (Brandon Spikes is the latest addition to the roll call of missing players), the New England team is down to undrafted rookies and Tom Brady. All his best receivers and best friends have taken a powder not seen since Richard III went looking for his horse. Brady alone is still better than 30 other NFL teams. Whether it is enough to be better than the final two, only the next game will tell. Of course, having Adam Vinatieri and Deion Branch on the sidelines for the Colts will give Tom Brady a slightly sickening feeling, which may be worth the expense for Colts owner Jim Irsay. As of now, Lady Luck’s grandson is about to grace the tundra at Gillette Stadium. Lady Luck goes back to the Sinatra years when the fickle woman of song screwed up the cool Rat Packer. Belichick is no Sinatra, but he will roll the dice with Tom Brady any Sunday you pick. Andrew Luck, Lady’s grandchild, may need to blow on the die for a victory. Any advantage in a storm is desired. And, since the long range forecast is for reasonable and standard January conditions, the Patriots will have no bad weather Luck on their hands. Tom Brady does it his way too! The New England Patriots hit the road again this weekend, Jack, and they may come back to Foxboro no more like an undefeated team. Week after week they have defied the odds and the oddsmakers. Some of their luck is owed to NFL scheduling—and some of it to old-fashioned Tom Brady heroics. The Red Sox aren’t the only ones with an impossible dream. Yet, we know the Patriots cannot keep taking the hits. The wall is a hard spot to hit. If X marks the spot, then Cincinnati could offer their usual bungles to help keep the Patriot Place/Potemkin Village of victories alive for another week. Vince Wilfork has rumbled off to the Old Elephant Burial Grounds, maybe gone for a year, maybe gone forever. This leaves only one member of the herd who recalls the glory days of Super Bowl winning. Tom Brady may be all you need. Nowadays the Patriots look like Marlene Dietrich on her farewell tour: it’s a trick done with smoke and mirrors. Tom Brady may be the New Dietrich. And, he’s not just a gigolo, nor is he like a virgin when it comes to winning the big one. Frank Sinatra managed to do a farewell tour with his Rat Pack that gave echoes of his heyday. Tom Brady and his rat pack may be singing the same tune in one note. If you meet a team coming through the rye, the Patriots likely will take any road to reach Zanzibar. If the Patriots have met their opponents at groundhog level, the opponents have found their hopes falling into a sinkhole. Tom Brady sings that refrain every week, if you walk through a storm, hold your head up high—and don’t be afraid of the dark. Walk on, walk on, and you’ll never walk alone. The fans will be with you. You may sing the blues now and then about the Patriots, but NEW ENGLAND PATRIOTS UNDRESSED will have you humming a different tune. Now available on Amazon.com in songbook format.